Socrates said that the aim of philosophy is to know oneself. For me, the cinema is the same thing. I try to know myself better, to relieve my pain about life. In your travels, you see different kinds of people, different kinds of lives and that makes you think. You ask harsh questions of yourself. I try to understand what it means to be human. There are certain kinds of people in every culture. These kind of people ask similar questions about life and it doesn’t change in New York or anywhere else. You meet these people in Iran, in Singapore, everywhere. And these kind of people make another kind of nation. Through films, you find your soulmates, who live in the same nation with you. 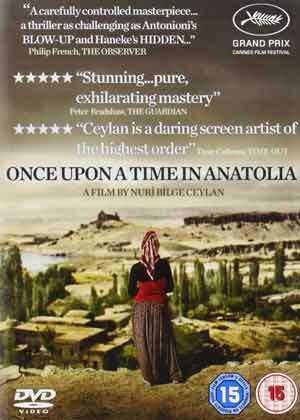 EVERY SINGLE TIME I watch the iconic sequence featuring the daughter of the mukhtar in Nuri Bilge Ceylan’s Once Upon a Time in Anatolia, I weep. Weirdly, it is not so much the arresting beauty of the young woman that precipitates such deep emotion inside me but rather the stupefied reaction of the assembled men. A simple crime drama transpiring over the course of a single night and day, with little plot development other than the discovery of a body, Nuri Bilge Ceylan’s understated masterpiece manages to encapsulate the vicissitudes and virtues of the human condition in the same manner as the great Russian writers Fyodor Dostoyevsky, Leo Tolstoy and Anton Chekhov. The films that bored me the most in the past became my favourite movies later on. So I don’t care about boring the audience. Sometimes, I really want to bore them because out of boredom might come a miracle, maybe days later, maybe years, when they see the film again. Born 26th January 1959, Turkish director Ceylan has built up an impressive volume of work both in film and photography, with Anatolia garnering the illustrious Grand Prix award at the Cannes Film Festival. And no wonder; he is one of only a handful of auteurs practising today whose main focus is to create a work of art—rather than a vehicle for entertainment—in the tradition of Andrei Tarkovsky, Ingmar Bergman, Michelangelo Antonioni, Yasujirō Ozu and Robert Bresson. Based on a true story, a convoy comprising the state prosecutor, medical examiner, police offices and gravediggers, together with two prisoners, journeys through the eerie expanse of the Anatolia steppe in search of a dead man. However, the darkness makes the murder suspects confused and after stopping at a variety of landmarks—water troughs, solitary trees, ploughed fields—the motley group are none the wiser as to the whereabouts of the corpse. There are so many characters in life. Sometimes you cannot know them in certain situations. You have a girlfriend once. You are with her for three years. One day, you go on a trip with her. In three days, you get more information about her than you did in the previous three years. In my last film and in most of the films, there are situations where through those situations you know the characters better. I think in this film something like that is happening. Searching for the body, you can see many characteristics, many properties, of these people more easily. I am fond of situations like that. In Anatolia, I was so interested by showing the different sides of the human soul through life and death. You see the reflections of the characters on many things throughout the story. As the enveloping stillness of the night descends upon them, their latent anxiety and tiredness manifest as upbeat, humorous chatter about the most inconsequential of subjects—buffalo yoghurt, biscuits, the exact distance between towns on a map. But soon, each character’s attention turns to their private lives, in particular those of the doctor and prosecutor, and the painful choices they have made, not least in relation to lost love. Indeed, the subliminal presence of the victim buried somewhere out there in the swathes of encroaching blackness exhumes suppressed emotions and harrowing thoughts. Through the elegant and lingering cinematography, Ceylan effortlessly reminds us of our own mortality during these crepuscular hours and how important it is to value what we have before it is too late. The pivotal point of the film occurs when the weary band of travellers partake of rest and refreshment at the home of the local mukhtar. Fornlorn and lifeless, they huddle in the gloominess, until they are served by the mukhtar’s youngest daughter with Turkish tea. Dog bark and the pulse of cicadas meld together with the susurration of the wind and tinkling tea cups, lulling us into a heightened state of awareness; as the daughter’s shadow dances over family portraits on the wall and then in a final shot where the light from her lantern accentuates her neck, eyelashes and cheekbones, we feel that we are bearing witness to the Beatific Vision. Each man embodies a different nuance of response to the daughter’s beauty—respectful admiration; bewitchment; stupefaction; utter dread. It is the final man, the main murder suspect, whose reaction moves me the most profoundly as he weeps uncontrollably into his bandaged, bloody palm, all pain and anguish etched into his wraithlike features miraculously transmuted into humble regret. It is as if the entire sins of the world are washed away by his baptismal tears in this exquiste extended sequence and I feel my own frustrations similarly absolved as I cry along with him. Form itself creates a kind of content. Form is not something, however, that controls the content. Form is in the centre and in some ways, for some artists, content emerges from the form. It’s certainly very important for me. Content is not content without the form. There is a certain type of event for instance. Different people tell the same event differently. Yet one person tells the event much more clearly, with much more meaning. It’s because of his form. The form is what convinces you. Where he puts the silences, whether he looks at you or doesn’t at certain points in the story, this is crucial. Somebody tells you a story in person, even if it is a very unimportant thing, if it is done well, you are very interested. They can make the thing really valuable for you. There is always something like that. The form has the ability to make the content more mysterious, more powerful, more real, more light, to imbue it with more truth. It’s everything really. In a final, parallel flourish of cinematic genius to that of the mukhtar’s daughter, we witness the doctor returning to his room after the exhumation of the body, exhausted from a gruelling, tortuous night. He has been deeply affected by the nocturnal events and is wrestling with his feelings as he performs the most mundane of tasks—turning on his computer, gazing out of the window, staring at his wizened features in the looking glass. He browses through a selection of black and white photographs: as a young boy on the beach on holiday; as a young doctor with friends and family; as a young man with an attractive woman deeply in love. The Anatolian landscape with its deadly shadows has formed a palpably aching nostalgia in remembrance for all things past and forgotten and again we are indescribably moved. We need to slow down our life’s beat in order to sharpen our perception. As with all his other films, Ceylan reminds us of our fragile, seemingly futile existence in the cold light of the Istanbulite sun. There are no happy endings for our characters as they resume their daily business, other than a reflective poignancy and bittersweet remorse. Their hearts may have been opened by the divinatory visitation of Beauty herself but nothing has fundamentally changed, only their apperception of life itself. T. S. Eliot once reminded us that humankind cannot bear very much reality. And yet, when reality is thrust upon us, we are inevitably forced to succumb to its all-encompassing stranglehold, with its inherent pain and regret and suffering, through which, paradoxically, we may find quiet resolution and acceptance, and even, perhaps, a modicum of peace.